With their Advanced Manufacturing Center, the Community College of Denver has set out to develop the next generation of workers and combat the ever-growing skills gap. “Helping people train for jobs and upgrade their skills is essential for economic growth,” Vice President Joe Biden told students at the Community College of Denver’s Advanced Manufacturing Center (AMC) last fall. “You can be the best mechanic in the world and in the work force for 30 years,” the vice president said, “but without training on new machines, you’re out of a job. The vice president proudly remarked that community colleges are the best kept secret in America because they are the most flexible educational institutions. Mr. Biden praised the AMC as an essential part of developing a competitive workforce to support the manufacturing industry. And it is doing just that. With its new facility, solid programs, partnerships with local businesses, as well as support projects and national grants to help with funding, Community College of Denver is paving the way to bring new men and women into the manufacturing labor force. It has been no secret that the U.S. manufacturing labor force is aging and retiring and that a skills gap is facing the manufacturing industry, which is expected to result in two million jobs going unfilled. Reports from the National Association of Manufacturers show that over the next decade, nearly 3.5 million manufacturing jobs will likely need to be filled. CCD is filling this gap with its new state-of-the-art Advanced Manufacturing Center (AMC), a 33,000 square-foot facility, to train new and incumbent workers in machining and welding. The AMC, which opened last fall, offers stackable certificate and degree programs. Students can earn a certificate and start working right away while continuing on towards more advanced certificates or associate degrees in their field. Often, CCD students are eligible for internships or apprenticeships while still in college thus increasing their earning potential. Non-credit training programs were also created to meet industry needs to provide corporate and specialized training programs for employers. 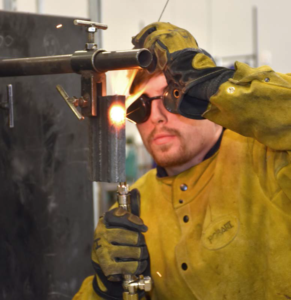 With the shortage of welders and machinists in the industry, students have been readily finding jobs within the state prior to graduation through connections with various partnerships, including the Denver Office of Economic Development and Colorado Office of Economic Development and International Trade. These partnerships work on new ways to develop our Colorado workforce and not only train new workers to be highly skilled welders and machinists, but teach advanced skills to our experienced workforce offering them the opportunity to earn a better income and provide more job stability. While manufacturing has traditionally been a mainly male-dominated field, CCD is encouraging women to explore careers in these fields. This is true of all of CCD’s manufacturing programs, which include machining, welding and engineering graphics and mechanical design, each of which have women who are in currently going to school and working in their chosen field. Creating career pathways for young women in these fields is high on CCD’s priority list. Through funding from the Women’s Foundation, CCD created the “Project DIY” summer camp, whose goal is to engage 9th and 10th grade girls in manufacturing/STEM careers and give them a hands-on experience of what it means to be in manufacturing. Chris Niksar, CCD welding faculty member, is a great example of this. As a young girl, she took a metal shop class at age 11 and loved it, but no one suggested this as a career option for her. By the time she was 25, she made the decision to become a professional welder. 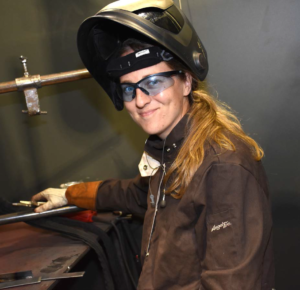 Like many women at that time, Chris was not given the option of a career path in the welding or manufacturing industry because she is a woman. While that may have been the norm in the past, the trend is slowly starting to change towards opening the door to more women in manufacturing. The Machine Shop brings state-of-the-art equipment and training to our students. The machine technologies program begins with basic manual mill and lathe, print reading, and advance to 2 axis mills and lathes. Students in the machine technology certificate and Associate of Applied Science degree use 3 and 4 axis machines. Classes in 5 axis milling, 6 axis dual spindle lathe and wire EDM are also available for advanced training for experienced workers, giving them a chance to enhance their skills and providing more opportunities for both employee and employer alike. A partnership with Georg Fischer Solutions helps to develop training for incumbent workers on our 5 axis and Wire EDM equipment. With lights-out manufacturing taking hold in the industry, CCD’s machine technology programs train workers to program and run these highly advanced machines to support this industry trend. The College also plans to open an advanced metrology lab in spring of 2017, developing training in SPC, CMM, optical comparators and GD&T. Students build a solid foundation from the fabrication welding program to become an arc welder, fabrication welder, basic or intermediate welder with a certificate or an Associate of Applied Science degree. CCD also offers stackable certificate programs for students to gain the skills and training needed to start working right away. In addition to basic welding techniques and print reading, we prepare students to test with the American Welding Society’s certifications in SMAW, MIG/TIG, and 6G welding. CCD’s engineering graphics and mechanical design program teaches students to become mechanical drafters, how to prepare detailed drawings using 2-D and 3-D that show how to assemble a wide variety of machinery and devices. Training in 3-D modeling and 3-D scanning and printing is also part of the curriculum. Partnerships with local museums have provided students with real world experience through a program that has been restoring artifacts for a local car museum. By printing car parts that are no longer available on CCD’s 3-D printer, students have been helping a local museum rebuild unique museum pieces for antique cars. CCD, along with other colleges and universities throughout the state, is working through a grant from the Colorado Space Grant Consortium, which has an established set of successful hands-on programs that allows students to actively participate in the Rock-SAT program. The program gives students from multiple program areas the opportunity to work together to design, build, and program experimental hardware that met NASA requirements. The experiment was then placed in a rocket that was launched 73 miles above earth last June from NASA’s Wallops Flight Facility in Virginia. Out of the experiments that were launched, only three worked and CCD’s was one of them! CCD works to engage all of its students in the manufacturing industry by providing them with career pathways through internships and apprenticeships, helping them find future careers. Students who participate in internships are more likely to find future employment more quickly. According to Forbes online, 60 percent of paid internships and 37 percent of unpaid internships result in job offers. Currently, we have several students working in the machine and welding shops at The Denver Mint, a local company that has an active apprenticeship program providing job skills training and employment opportunities. Colorado Helps Advanced Manufacturing Program (CHAMP) is a federal grant from the Department of Labor awarded to Colorado community colleges with an ultimate goal of increasing the attainment of degrees and certifications in manufacturing. This effort is a substantial push to serve Colorado employers’ needs and to align future employees with industry-recognized skills and competencies. The grant helps CCD to develop new curriculum for our programs as well as provide advanced equipment for the AMC. The TAACCCT grant, or Trade Adjustment Assistance Community College and Career Training Grant Program, which was signed by President Obama in 2010, provides CCD with support and resources to expand manufacturing programs. 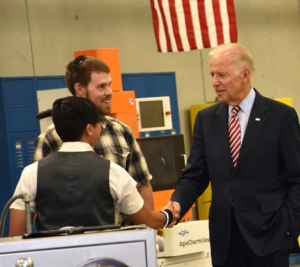 It was the TAACCCT grant that brought Vice President Joe Biden to the Advanced Manufacturing Center in July of 2015 to host a roundtable with government officials, industry partners, employers and students. With nearly 8,000 students, the Community College of Denver is located on the vibrant Auraria Campus in downtown Denver. As a leading point of entry to higher education for the city and county of Denver, CCD offers small-class sizes and flexible schedules, career and academic programs, award-winning professors, extensive advisory and support services, world-class facilities, easy access via RTD light rail, and affordable tuition. CCD is a federally designated Hispanic Serving Institution and is one of 13 community colleges in the Colorado Community College System (CCCS). For more information, visit www.ccd.edu/academics/centers/career-technical-education/advanced-manufacturing.